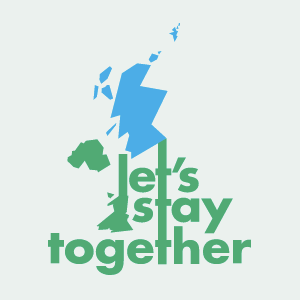 Today sees the launch of a UK-wide campaign called Let’s Stay Together which aims to give a voice to everyone who doesn’t have a vote in the decision to break up Britain, but wants to try to influence the vote in favour of Union. The campaign’s aim is to get pro-union people from across the UK, who don’t have a vote in the referendum, to publicly state online, and maybe even in real life, that “Scotland is part of our UK family and I want us to stay together”. The launch piece of content uses Queen’s ‘You’re My Best Friend’ as a soundtrack and features celebrities from all over the UK including: Tanni Grey-Thompson, Eddie Izzard, Ross Kemp, Ian Rush, June Sarpong, Dan Snow, Susannah Constantine and Trinny Woodall. The video is wonderfully upbeat and is markedly different in tone from much of the Better Together campaign. The video and wider campaign cleverly gives license for people from across the whole of the UK to have their say in the referendum. It is carefully respectful of the fact that it is the right of the Scots to decide whether to remain in the union. But the video will give confidence to those who might have worried about articulating their positive feelings about the UK to speak out and let Scotland know that they do care about the future of the country and want the jocks as part of it. Snazzy logo? Separate bits of UK with England left out? Three letters joined up to make a vertical that does not relate to the design? Weak colours? No idea where you get the idea this logo is ‘snazzy’. The videos offer no political content and rely on lite entertainment and sentiment rather than proposing a positive, progressive and more democratic future for Scotland remaining part of the UK but, of course, no one has yet made that case. Blue and green are ‘weak colours’? I’ll alert the Conservative Party. Re: your comment about the lack of political content – the approach they’ve taken is to ask people outside of Scotland why they want it to remain part of the union. Those reasons are very often emotional and highly personal, which is perfectly valid. Normal people (or even celebrities) don’t tend to make impassioned, comprehensive political arguments. Re: your comment on ‘jock’, it’s not racism (unless you’re claiming Scottish people are a race, not a nation). It’s not a pejorative term (particularly not in the context I used it); it’s no different to words like Brummie or Scouser being used as an affectionate shorthand to refer to people from their respective regions of the UK. But EVEN IF your political correctness radar was right and only Scots are allowed to use it, I’m lucky enough to have a rich Scottish heritage. The clue is in the surname. Benedict, just because you claim to have a Scottish surname doesn’t give you a ‘get out of jail free’ card for using pejorative terms like ‘jocks’. It is as offensive to Scottish people as ‘paddies’ are to the Irish. And yes, discrimination against Scots, Irish, Welsh and English for their nationality is regarded as racism under UK equality laws. As for the purpose of your post on CIPR Conversation, I agree with Jack, the logo is confusing if it is trying to suggest a United Kingdom and where the colour green comes into it is anyone’s guess. The Tories only use blue and green in the rest of the UK, not in Scotland (red, dark blue and light blue in form of a Saltire). The video itself is a well-produced collection of Labour luvvies who have all more or less being up here before telling us how to vote. I will be interested in your view of advertising measurement and evaluation of this particular video. Its goal is to increase the No vote through third party engagement (ie rest of UK residents engaging Scotland residents) rather like David Cameron’s ‘love bombing’ speech at the Lee Valley Velodrome. Interestingly, after that intervention support for YES increased dramatically. Polling suggests that sentiments of warmth towards the Union and Scotland from outside of Scotland have had a positive impact on voter intention. A case in point being David Bowie’s intervention at the Brit awards. So it wouldn’t surprise me if this video is effective.